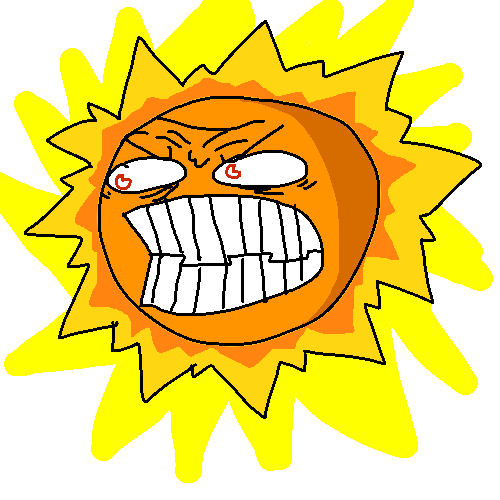 I have discovered over the past several years that the splendid and blazing sun is NOT my friend. And I go out of my way to stay far far away from it or use serious protective measures when forced to interact with it. As a personal choice, and I admit that perhaps I have taken things to excess, I try to avoid going out in the sun when at all possible—especially in the summer. It’s hot, bright, and downright dangerous. Now I realize that the sun is the star at the center of the solar system. And it is by far the most important source of energy for life on Earth, but I am no longer prepared to toast myself under it. Energy splenergy. In the good ole days, I would varnish myself up with a mixture of Johnson’s baby oil and the dark red tincture of iodine, or Mercurochrome. Like a mad chemist, I would create a murky orange mixture, adding 1/8 cup or 1 fluid ounce of the topical antiseptic to 1/2 cup of oil. Then I would shake it up vigorously and often because the iodine would tend to separate and sink to the bottom. I’d rub that orange glop all over my hair and body, creating a yellowish brown tint to my skin. Then I would “lay out” for an hour and a half on each side, turning every once in a while like a chicken on a spit, basting myself with the oil compound as needed. Shake and bake. Oh, and because I bit my nails, the antibacterial concoction was fairly painful to apply. And if I had any open cuts they stung like hell. As if that wasn’t enough, I would use a sun reflector on my face, or create a DIY by wrapping a record album cover with sheets of aluminum foil. I would also check my tan line regularly to make sure I was getting the full Monty. The darker and/or more sunburned I got, the deeper the satisfaction. My best friend Robin is convinced that I am a vampire since I don’t usually make my outdoor debut until it’s dark out. That’s not entirely correct. I happily come out around 6ish, although I still wear sunblock. While my husband lounges around on our magnificent, ridiculously pricey to install, and useless-to-me Trex deck, I am ensconced in our basement/lower level. I like it there. It’s muggy, dark and dank. I can catch a glimpse of the sun from my basement windows, which is good enough for me. But should the sun’s reflection hit my skin, all bets are off, and I make sure that the curtains hermetically seal all light trying to reach out to me via the windows. Trips to the beach? A major undertaking, involving a plethora of clothing, sunglasses, lotions, umbrellas, sun hats, and other paraphernalia. Invitations to pool parties, boat excursions, outdoor barbecues, and the like? Ditto. I can’t exactly pinpoint when my fear of basking in the sun began to maniacally manifest itself. Nor can I recall any particularly harrowing event that caused me to first mildly dodge, and then completely avoid its rays. But it was a gradual process, and now my unwillingness to absorb vitamin D via sunlight has me wondering if I have developed some sort of sun phobia. Whatever my avoidance behavior means, I have an obvious hang-up, and it is unlikely that I will ever enjoy a spattering of fun in the sun again. Whenever I have a pressing question or issue, my usual modus operandi is to fire up my computer and Google it. This never seems to work out that well for me. While my Internet searches can sometimes lead to the right answers, they have oftentimes led to the wrong answers. This by the way, (according to one of my innumerable searches) is called Cyberchondria: the unfounded concern over common symptoms based on online literature and research. Anyway, back to my search. I found that Heliophobia is the fear of sun or sunlight. 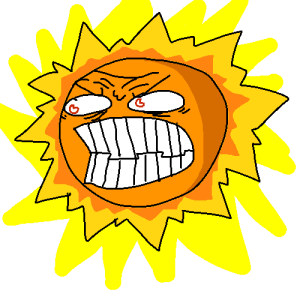 According to the many online entries I studied, people develop this phobia because they are afraid that if they are in the sun too long it might give them cancer. To be clear, my angst has zero to do with cancer. If anything, I’m afraid if I stay in the sun too long, my skin is going to morph into leather. Is there a phobia for fear of leather bod? I was relieved to find that no—there is no phobia connected to skin leathering. But there is a phobia for wrinkles called Rhytiphobia. Phew—I am confident that I do not have Rhytiphobia, because wrinkles don’t bother me, and since I have plenty of them, that’s a good thing, right? Google says it is generally assumed that phobias arise from a traumatic event. Not so with me. The most traumatic event I have ever experienced with regard to sun issues is eyeballing the wrinkly and leathery masses who have exposed themselves to way too much sun. It’s their weather-beaten scraggy neck and face skin that skeeve me out the most, and make me fairly squeamish and a tad on edge. Why and how anyone with skin like that would think it’s attractive is beyond my comprehension. Googs says that a typical phobic reaction would include dread, panic, anxiety, shortness of breath, rapid heartbeat, nausea, excessive sweating, cotton mouth, a loss for words, and shaking. I don’t feel any of that, although I definitely require a plan of action several hours ahead of any type of sun exposure. Googs also says that sufferers of Heliophobia often cover themselves with long, protective clothing when going out during the day. They may also avoid going outdoors any old time the sun is bright, including incidental exposure like driving in the car or working near a window. I am sensing a familiarity with moi here. I do have an unlimited supply of sun resistant rash guards, swim tops, sun-protective leggings, swim pants, UPF 50+ sun hats, sunglasses, zinc oxide, and titanium laced sunscreens. Even I will admit that my obsession with a sun-free life is no way to spend my summer days. That being said, I am still going to be walking around with a white pasty cast to my skin anytime I venture out during the day. I love love pale skin. When my friends alarmingly tell me I look pale, I consider it a compliment. Sorry people, but a tan does not mean healthy. I did uncover an alarming tidbit on VampireWebsite.net: Long, long ago in a faraway land, Heliophobia was considered a telltale sign of vampires. For those of you who are wondering, NO, I am not a vampire—despite my Draculess nickname. But am I a heliophobe? My favorite kind of day is cloudy, gloomy, rainy, and stormy. I’ve been known to hotfoot it out to my fab Trex deck on a thunderous, menacing day—and wash my hair. And so that you don’t think this blog entry is entirely centered around my selfish, myopic and phobic self, I have put together some sun info I’ve discovered post baby oil and iodine to help you all out. Number one thing I have learned is that all sunblock products are not the same. Ingredients matter. A lot. UV picks up at midday, so I plan around the sun. When running errands, I try to get outdoors in early morning or late afternoon, when the sun is lower. UV rays from the sun can nab you on cloudy and hazy days as well as bright and sunny days, so beware between 9am and 4pm. Sunglasses are not just a fashion accessory for me—they are a necessity. UV radiation can cause cataracts and other serious eye issues. And never rely on sunglasses alone. Men seem to think they are immune to the sun’s negative rays. Hey you guys: DO NOT ignore sun safety. You do so at your own peril. According to EnvironmentalWorkingGroup.org’s online guide to sunscreens, in 2012, twice as many American men died from melanoma than women. Stay away from vitamin A when choosing a sunscreen. Too much pre-formed vitamin A in anything, including retinol, retinyl, retinyl palmitate, retinyl acetate, and retinyl linoleate, can cause a variety of serious health issues. And it’s in a whopping 20 percent of all sunscreens. Vitamin A is an antioxidant and is added to skin products because manufacturers believe it slows skin aging. And perhaps it does help to make skin look more youthful in night creams and lotions—when used at night and indoors. Government data show that creams laced with vitamin A can actually speed up the growth of cancerous tumors and lesions when used on skin exposed to sunlight. Avoid Oxybenzone, when picking a sunscreen—especially for children because it can disrupt the hormone system. It penetrates the skin, and gets into the bloodstream and acts like estrogen in the body. Look for products with zinc oxide, that toothpaste-like lotion that lifeguards smear all over their nose and cheeks. This powerful mineral is also known for its sun-deflecting ability as well as its nonirritating and non-allergenic properties and recommended for those who have sensitive skin, acne or rosacea. And don’t fall for high SPF labels. Any SPF value above 50, trick you into believing they will prevent sun damage. It’s a load of bull and gives people a false sense of security. SPF protection tops out at 30 to 50. 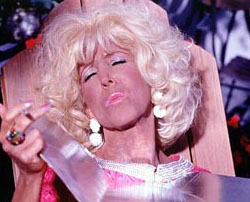 The FDA is considering banning any SPF claim above 50 and rightly so. And aerosol sprays may be convenient, but they can harm lungs, especially young lungs and can pose serious inhalation risks. Aerosol sprays are a definite no no for children. And speaking of children, it is very important to keep babies out of the sun. Infants lack the tanning pigments known as melanin to protect their skin, so keep them in the shade at all times. And call me neurotic, but the best way to protect oneself from the sun? It’s called shade. Reminds me of us going to Miami for the day, cloudy, windy, sort of chilly and I got so burned! Remember?? Bloody Mary’s on the beach with Peggy I think was her name!! I like sunny. It gives me a healthy skin! I want to have a healthy skin. Thanks for post! I can’t go out without applying sunscreen. But there are so many choices about this product in the market. That is difficult for me and someone else. Thanks so much for sharing some advices. I’ve been a vampira for 10 years. I’ve got EVERYONE beat. I don’t go out til 45 mins after the sun sets and am indoors about 45 mins before sunrise. I live in sunny California and have to wait til like wintertime to take planes to visit ppl on the east coast. I’m educated and yet, because i don’t want to sell my body for money, i have to live below my earning potential. I feel as tho a curse has been put on my life. I no longer do drugs as I did as a younger person and i rarely drink so the party is over in terms of enjoying the vampira thing. Men have been initially drawn to my mystique and then become horrified and or increasingly annoyed with my unwillingness to “change.” I’ve tried hypnosis. Nothing works. I thought visiting a dermatologist office would offer some comfort and instead it scared me even more because of the big poster board in the last office i visited years ago that said the sun is your number one enemy. And it’s not exactly like I’m melanin deficienct. I have skin like some Spaniards, I’m told. I’m originally light olive complected because my mother is of full euro Latin descent altho I am lighter now than i had been prior to my whole aversion thang.. In and out tha Matrix..